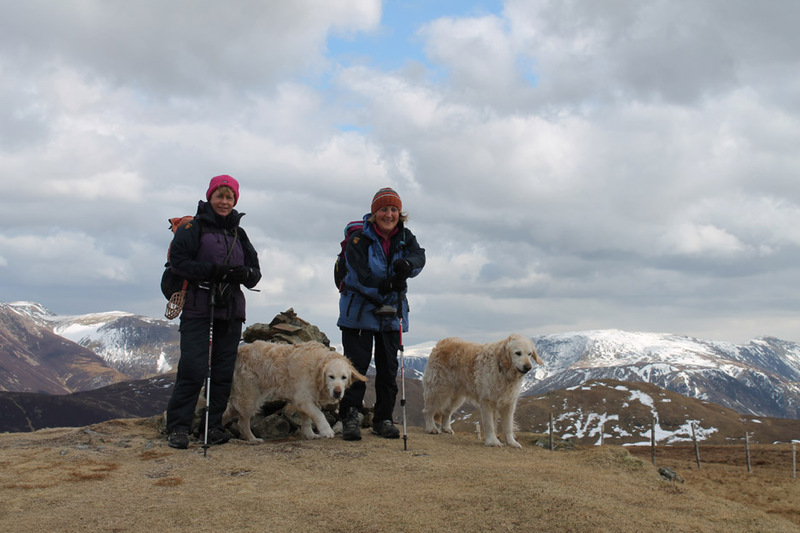 " Blake Fell with Jo and Alan "
Date & start time: Thursday 4th April 2013, 11.45 am start. 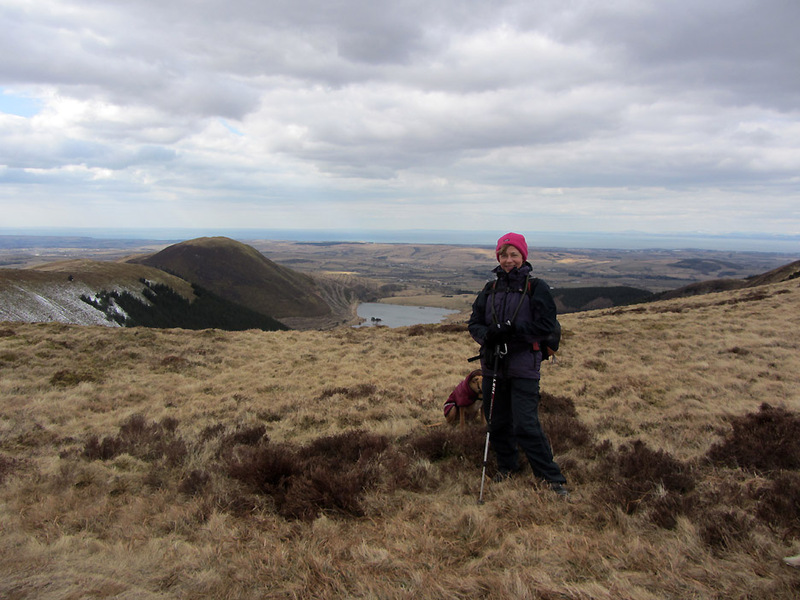 Places visited : Maggie's Bridge, Black Crag, Gavel, Blake, back via High Nook Tarn. 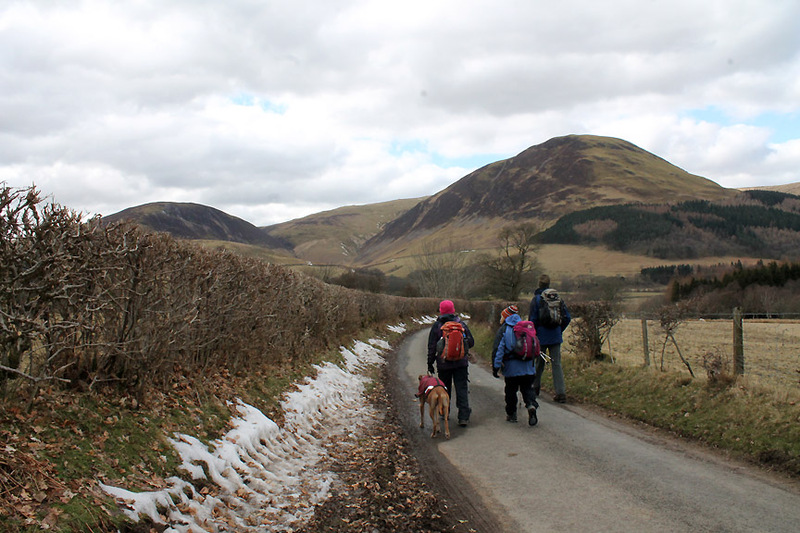 Walk details : 6.7 mls, 1975 ft of ascent, 4 hours 35 mins. 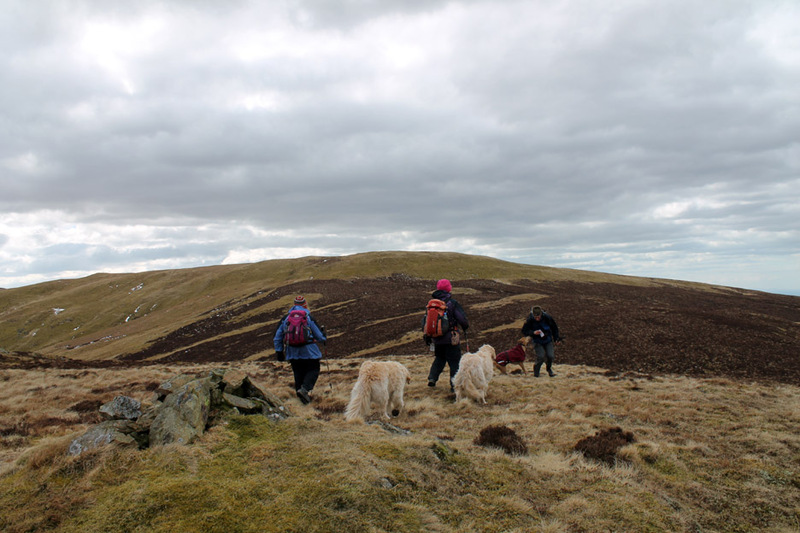 Highest point : Blake Fell, 1878 ft - 573 m.
Walked with : Jo, Alan Kilduff, Ann and the dogs, Amber, Harry and Bethan. Weather : Overcast and cold with a strong, cold easterly breeze on exposed slopes. which Alan hadn't done for a while. When he last did them it was cloudy and he didn't see anything . . . hopefully today would be better weather for him. The air clarity today is superb so Alan should be in luck. He has driven over from Lancashire for the day so he will be able to see what he missed last time he was over here. A quick picture before he arrives . 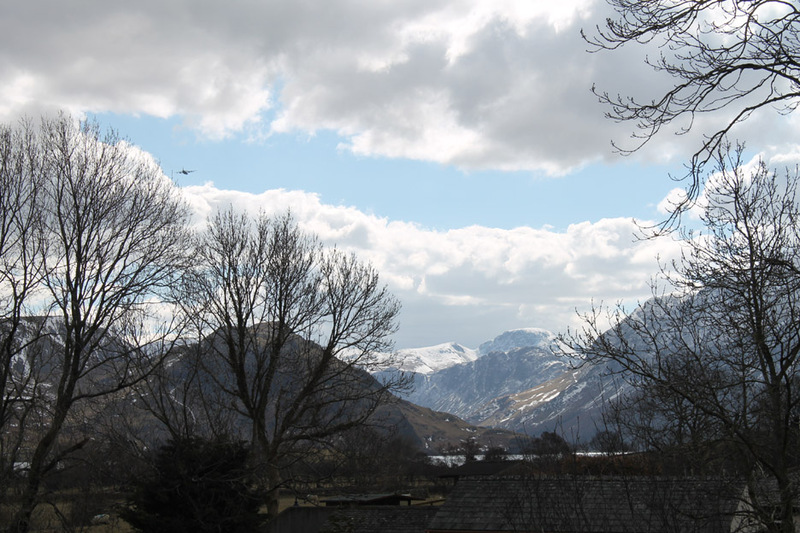 . . note the Hercules aircraft that has just flown over the house and on up the Buttermere Valley. He's not flying as low as they do sometimes . . . but I bet the view from his cockpit would be great today. 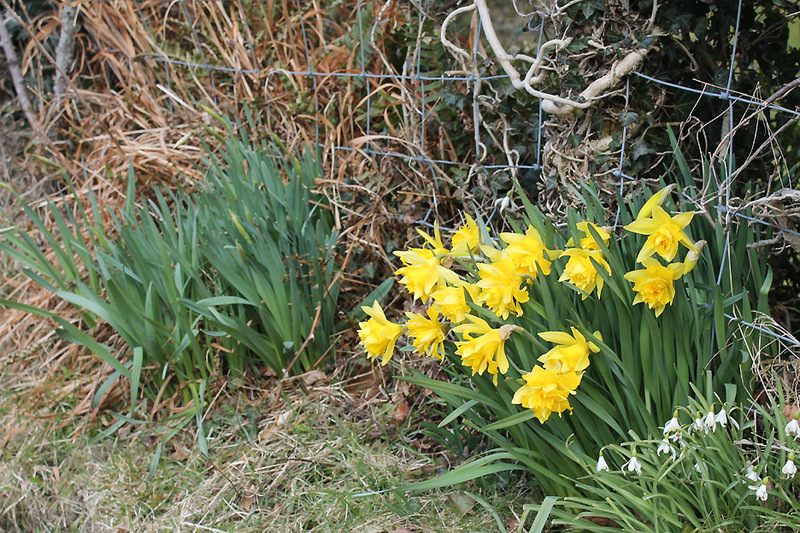 A few individual groups of daffodils are out but these double-cup ones must be an early variety. in order to burst forth and fill the gardens and roadsides with colour. all that remains of the drifts that blocked the road for a day. The river is low today ... the lack of rain has meant the grass hasn't grown either so the countryside is still looking rather brown. 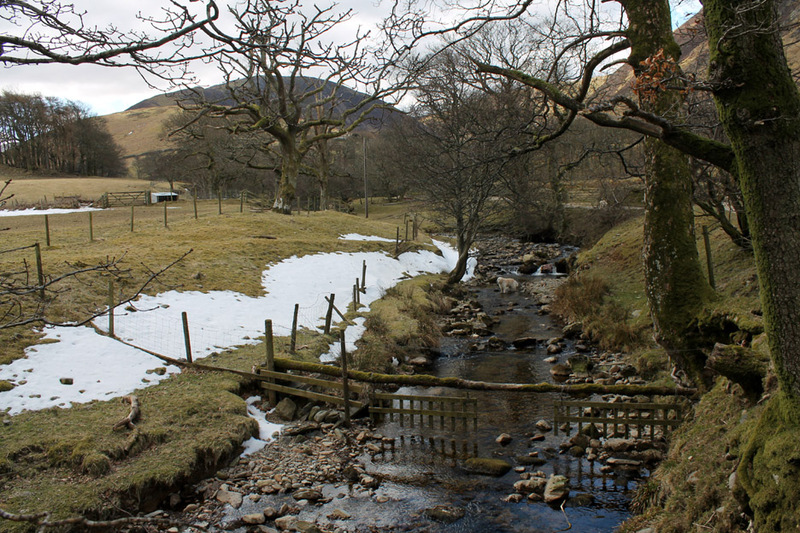 The sheep are having problems too as there is no spring burst of fresh green growth in the fields. 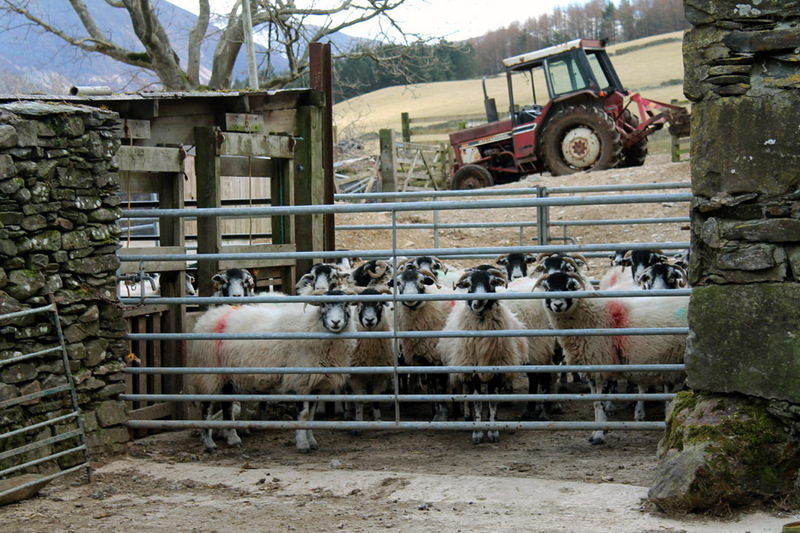 High Nook has brought many sheep into the farm for lambing but also to protect and feed them during this cold spell. The sun makes an appearance as Ann climbs up the track out of High Nook Farm. 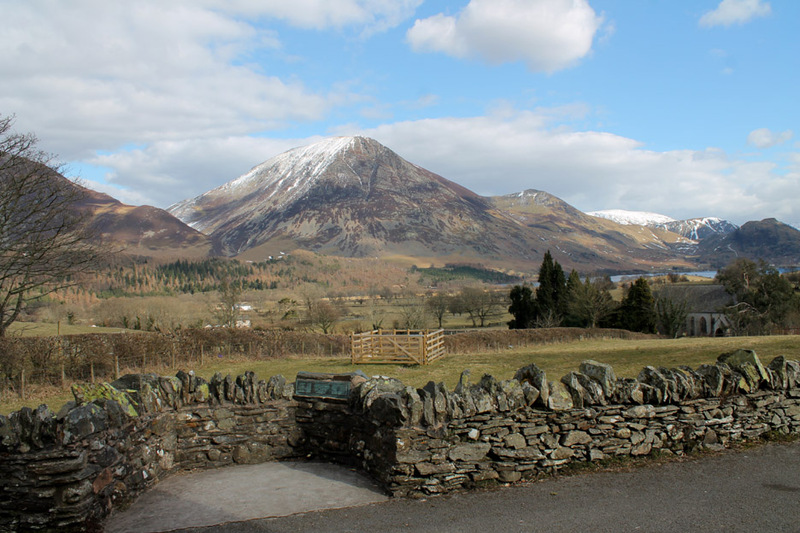 Behind are the twin peaks of Darling and Low Fell. 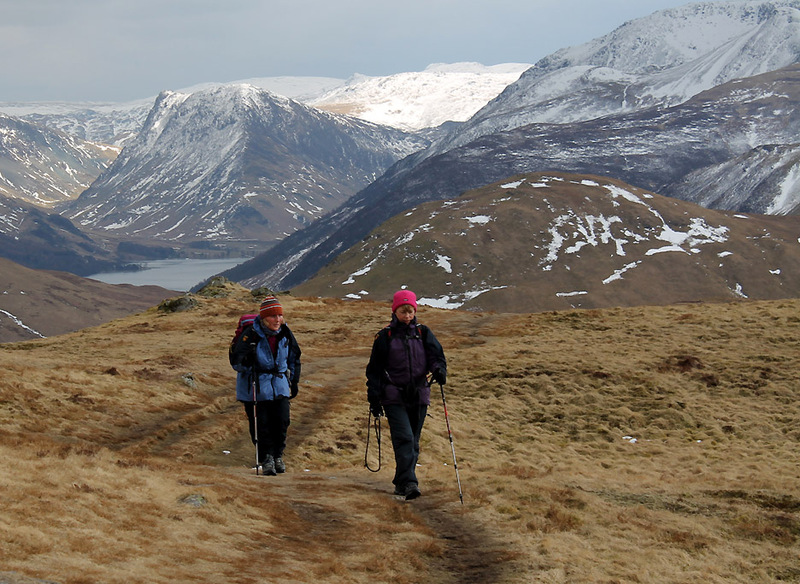 Ahead as we walk out onto the open fell is High Nook Tarn. Behind is the zig-zag path at the head of the valley that would be our return route from Blake, out of sight to the right. 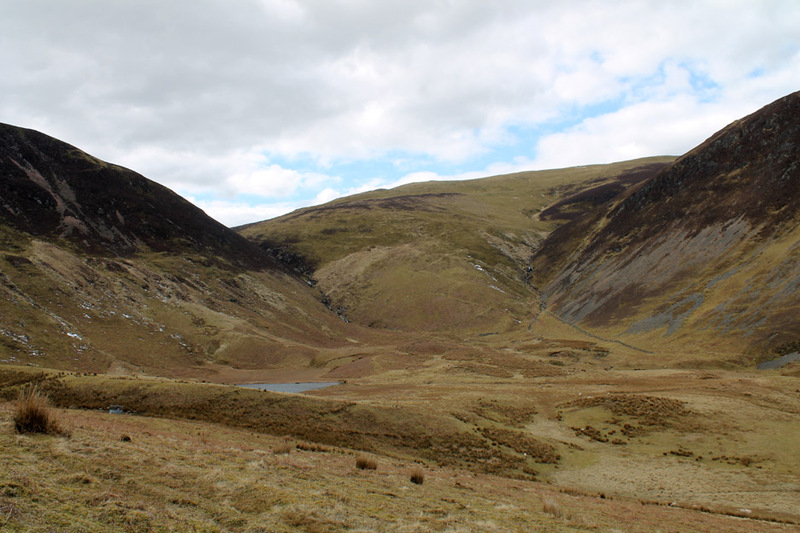 the heather covered climb on the left in the last picture . 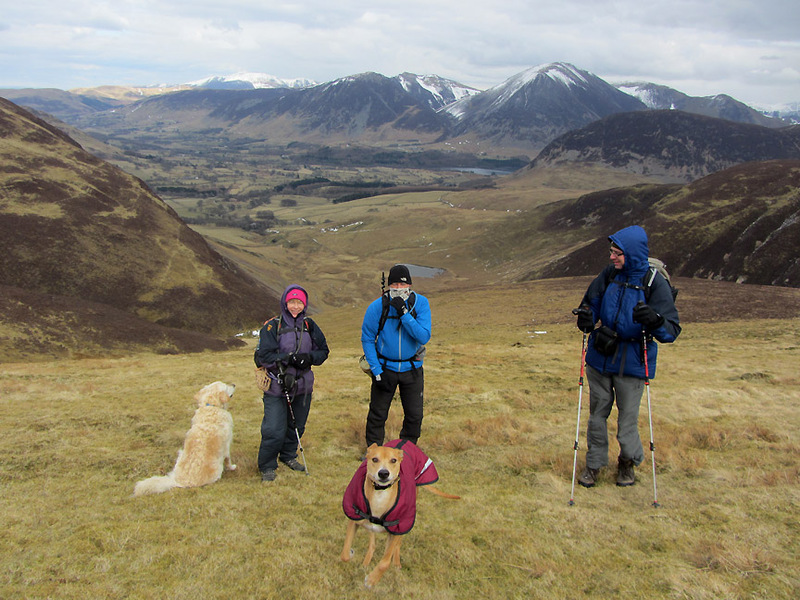 . . we took the easier walk up this ridge not the direct route ! Patchy sunshine highlights Haycock away in the distance above the Ennerdale Valley. 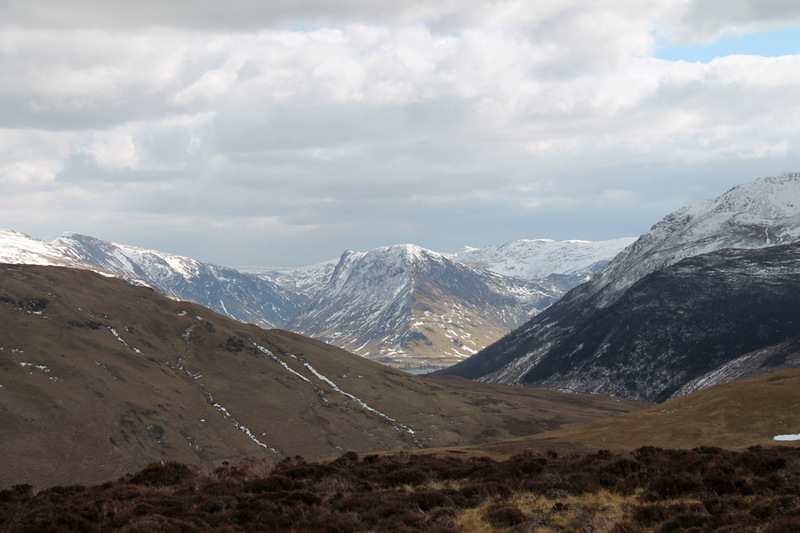 To the left we could make out the rocky, inverted 'V' which was the spur up to Steeple Fell. 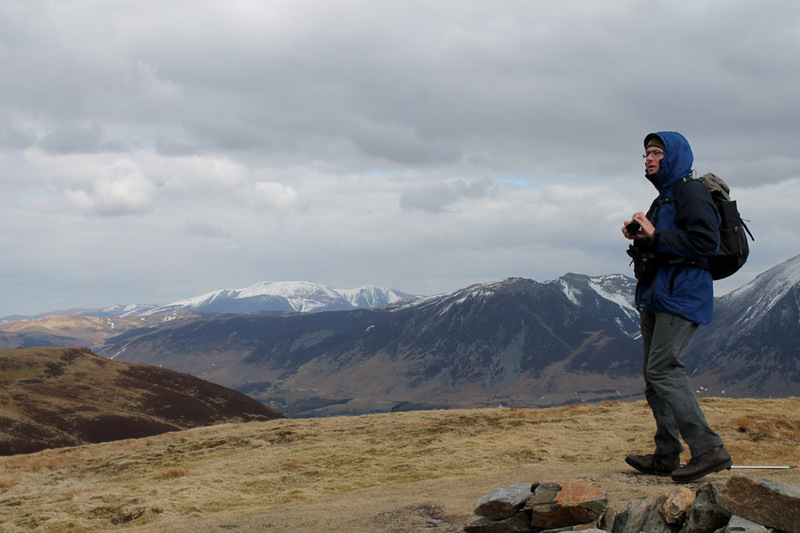 On the minor summit heading across to Gavel Fell in the distance. The full effect of the wind was felt when my small A4 map was whisked from my open pocket. Thankfully Alan, and it seems Amber, were on hand to collect it as it flew past them. Summiteers . . . Jo and Ann on Gavel . . . note the ears (the dogs ears !) blowing in the breeze. 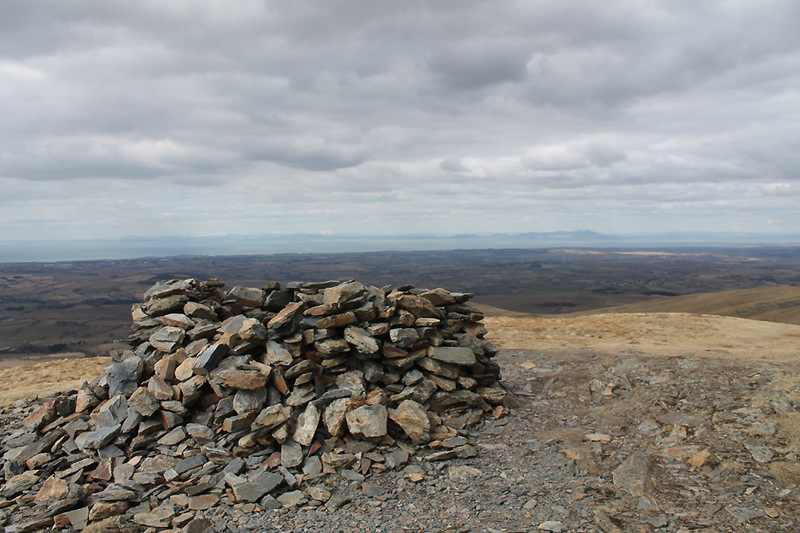 The view of the high fells from Gavel summit cairn. A closer view of Blake now as we are on the move to keep warm. There was no place to shelter for lunch on Gavel, especially as the wind was blowing hard from the east. The sun has gone in and, needing a little extra colour in the photo, Ann calls on Jo to pose with her bright pink hat. Amber hides her head in shame as her jacket isn't quite up to the colourful job. Striding out for the second summit of the day . . . Blake Fell. A nice round wind-shelter on the summit . . . but again the entrance faces east . . . letting in all the breeze. It copes well with the prevailing south westerlies but today we head a short distance over to the left to escape the wind and to eat our lunch. The view is better over here anyway . . . 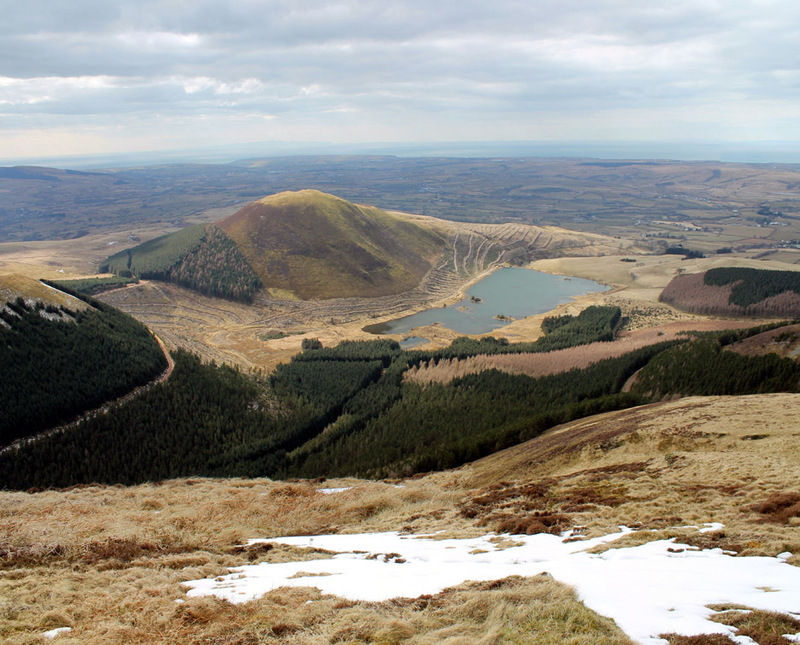 This is Knock Murton and Cogra Moss reservoir . . . with a hint of bright sunshine. Alan surveys the scene that he missed last time he was up here. 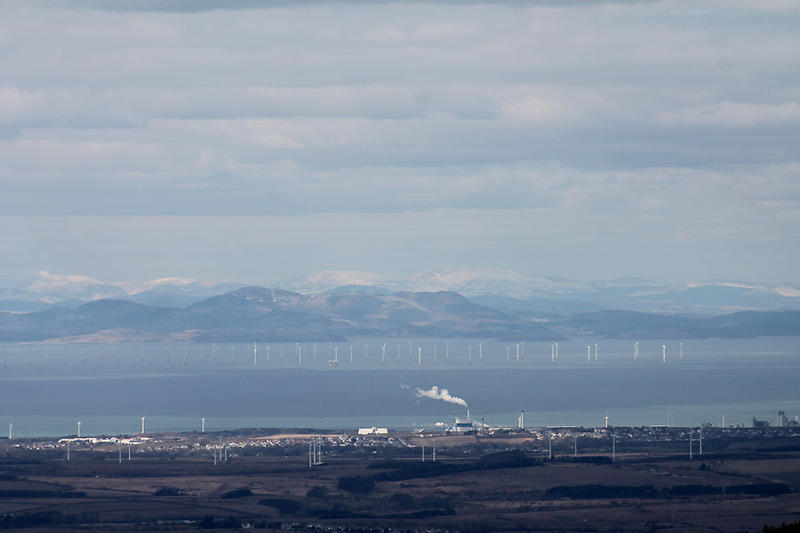 and the distant snow covered hills of Dumfries and Galloway. Out to the west . 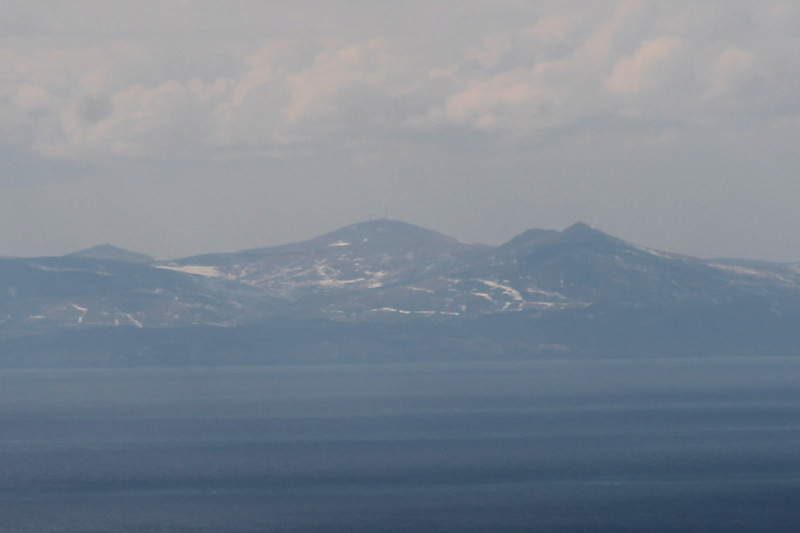 . . the Isle of Man, possibly as clear as we have ever seen it. 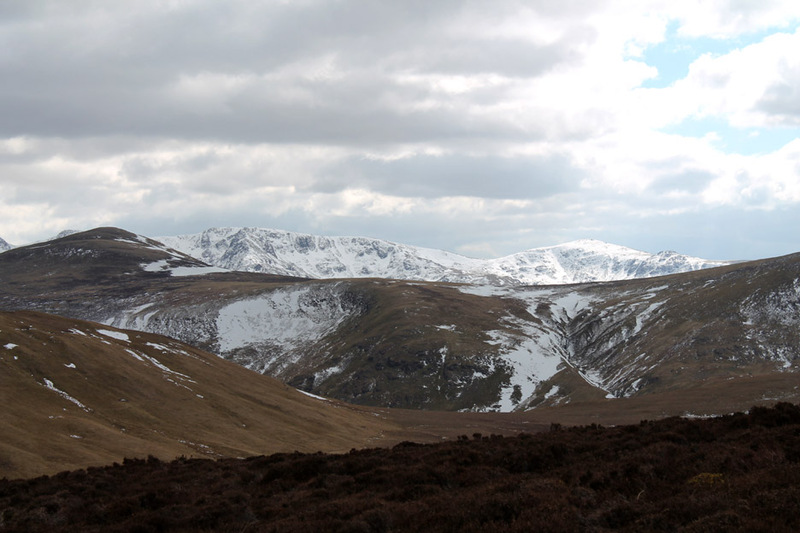 They suffered quite badly in the recent blizzards and even now the remnants of the snow can be seen on the hills. 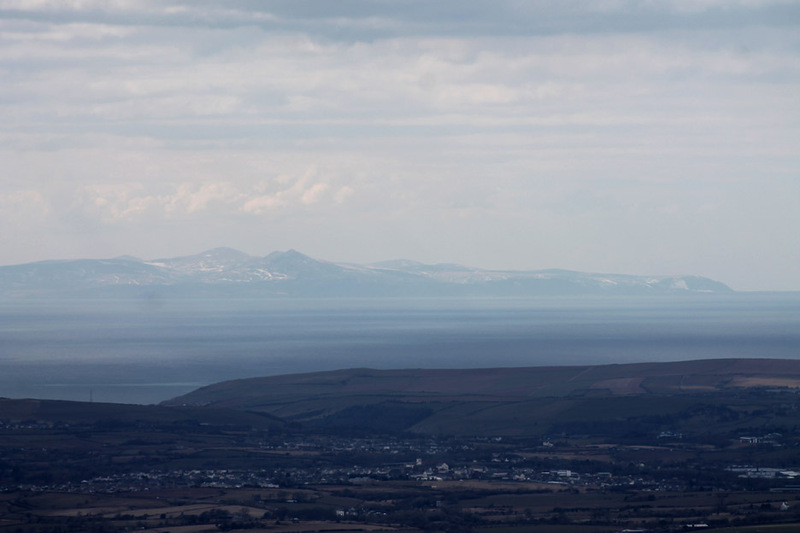 Snaefell (the snow mountain) is the only 2000ft mountain on the Isle of Man, standing at 2038ft - 621m above the Irish Sea. Time to stop taking photos and head on down . . . as it is very cold up here on the exposed summit. Well wrapped-up and back to the wind for this photo. 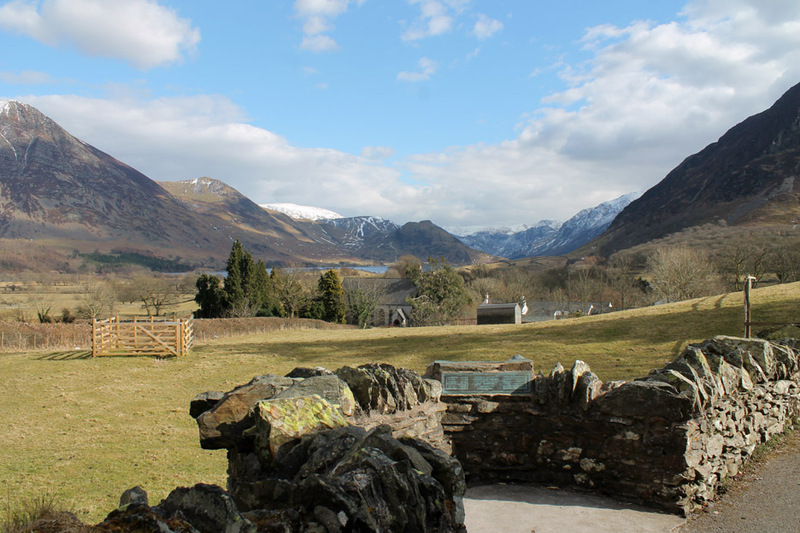 The wind is coming straight up the valley from Lorton having crossed the snowfields of Europe, the Pennines and the fells opposite ! Careful Ann . . . dog alert ! An old slate gateway high on the fells . . . a throw-back to an earlier age. Presumably there was a metal gate as there are hinge pins . . . and possibly the wall was much higher when first built. Alternatively it could have had a wire fence to extend it upward instead of extra stones, as there's an old metal post just a little further down. Navigation was easy . . . follow the wall down till you see the zig-zags. 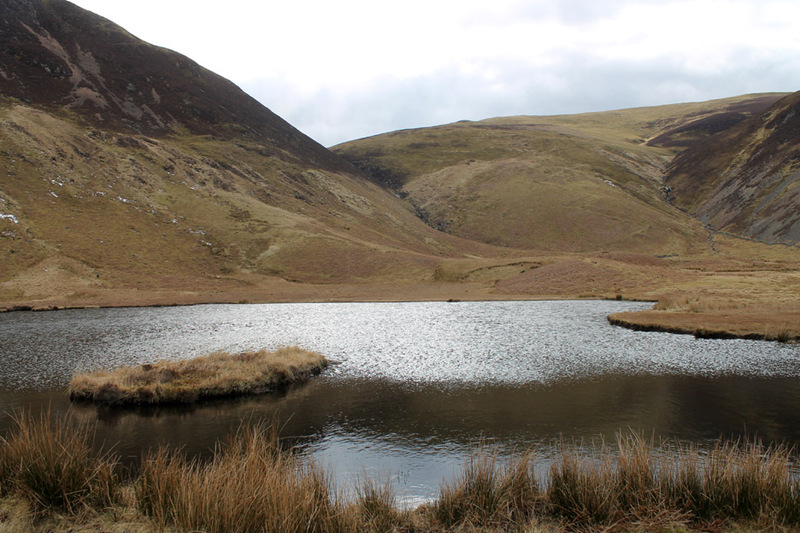 High Nook Tarn, where we started our climb, can be seen below. 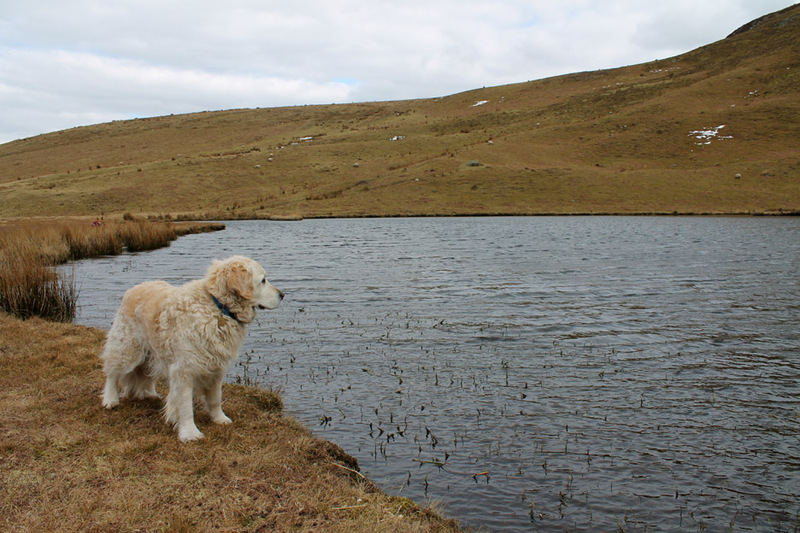 Harry contemplates the water but we discourage him from going in today. Looking back at out descent route from Blake. Just the road walk home now . . .
so we end up beautifully warm . . . in relative terms. 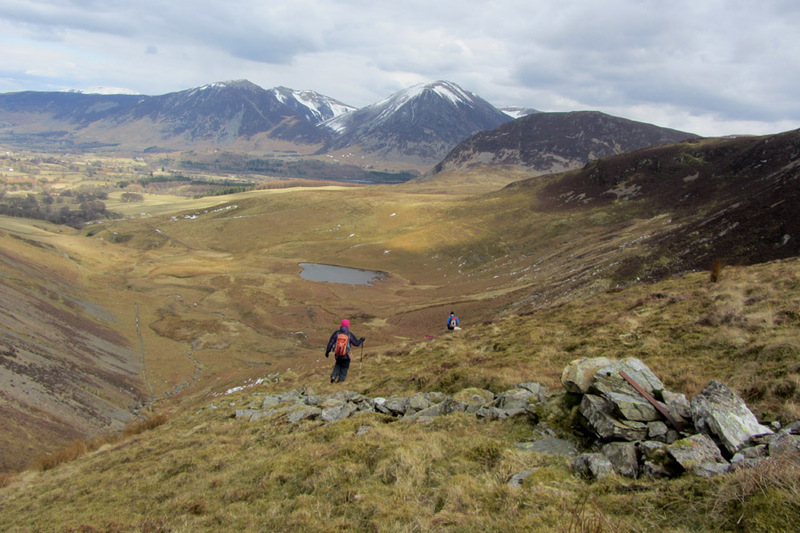 Two valley views to finish . 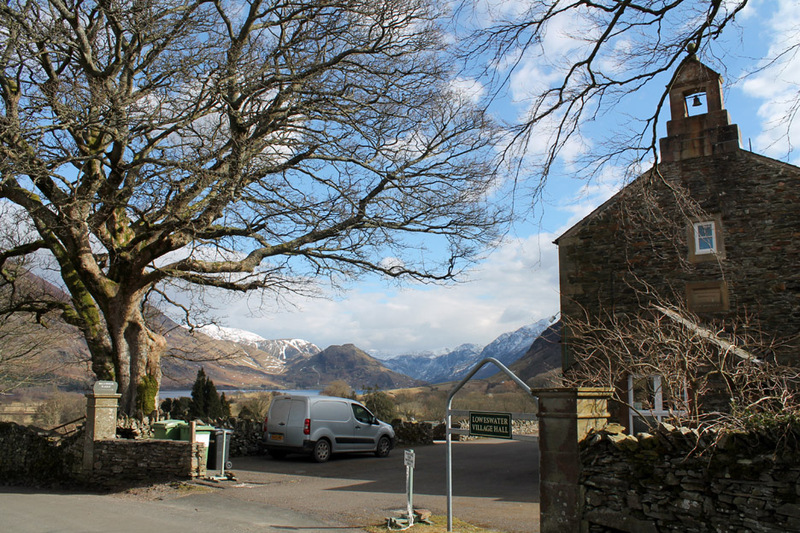 . . both taken from the car park of the Village Hall. The brass plaque and relief (partly hidden) were placed in the wall to mark the Millennium in the year 2000. 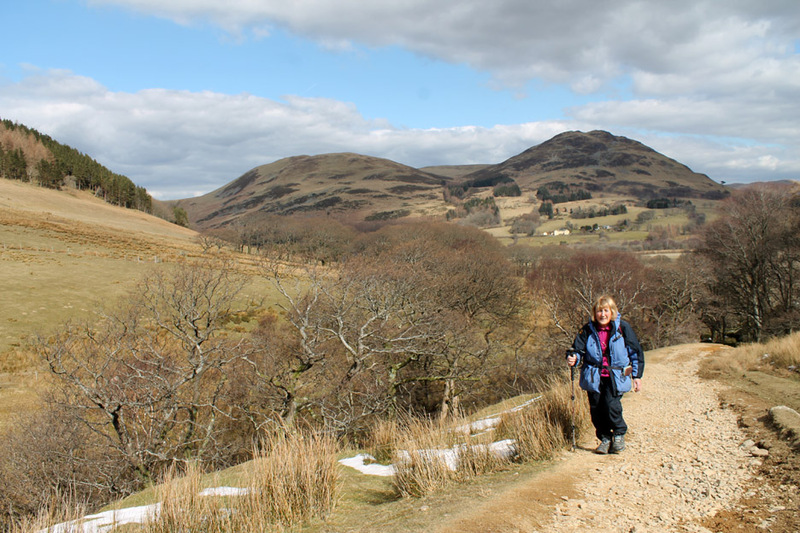 I love your the website and I keep up to date with your weekly walks in the Lakes. 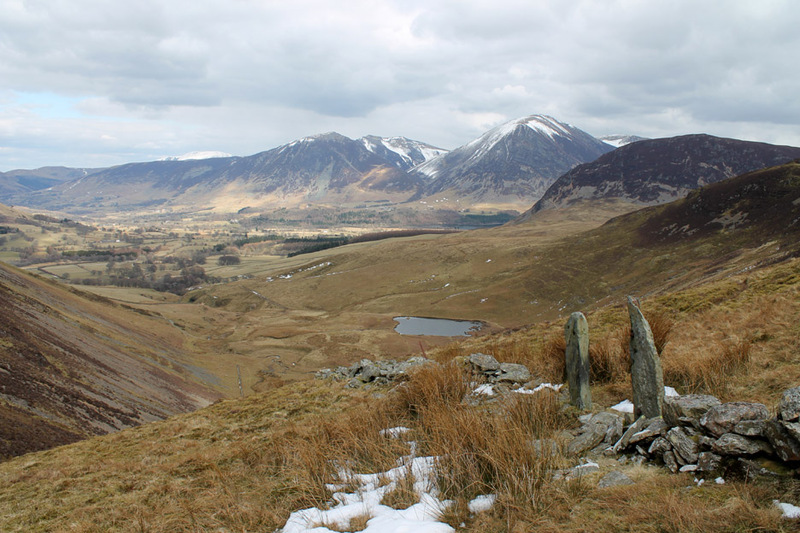 I am originally from Lancashire and spent many of my formative years walking the Lake district fells. 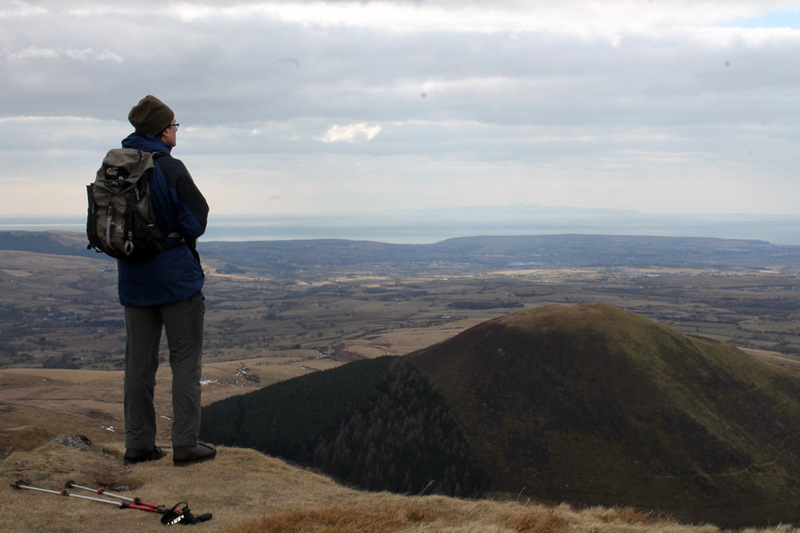 The island is a great place to walk and the IOM Government takes pride in maintaining the countryside and the hills. This site best viewed with . . . ana anemometer to really work out the wind speed and chill factor !